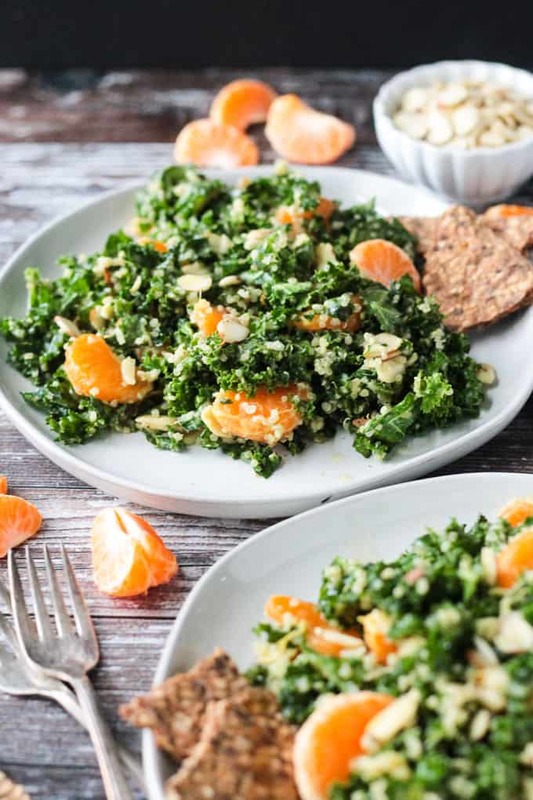 Massaged Kale and Quinoa Salad – my go-to kale salad! It’s super simple, loaded with plant protein, vitamins, and healthy fats (yet, oil-free!) It has tons of flavor and texture! Even the kids gobble this one up! I love making a big bowl of kale salad to eat throughout the week. Kale is hearty and sturdy and, even coated in dressing, will stay fresh for days. Massaging the kale with the avocado, lemon juice, and salt, breaks down the fibrous texture and makes it tender and easy to eat. It’s the only way I can get my kids to eat it…unless I hide it in something like my Kidney Bean and Kale BBQ Burgers! Packing this salad with quinoa and almonds boosts the protein and makes it all the more satiating. Sweet, juicy clementine segments balance the flavors and makes it more kid friendly. 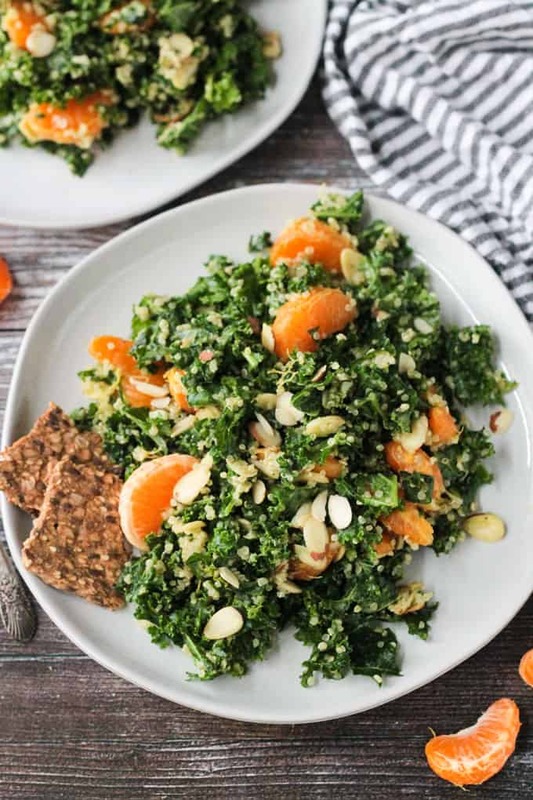 This Massaged Kale and Quinoa Salad is sure to become a staple at your house, too! Kale might not be quite as on-trend as it was a few years ago, but that doesn’t mean it isn’t still as healthy and nutritious as it was then. The vitamin K levels in Kale is off the charts. It’s also extremely high in vitamins A and C. Manganese, copper, calcium, fiber, iron, vitamin E, potassium, protein, healthy omega-3 fats, and folate are also present in impressive numbers. Whew! That’s a long list of nutrients! Kale is anti-inflammatory and has antioxidants. It provides cardiovascular support and potential cancer-preventative benefits. 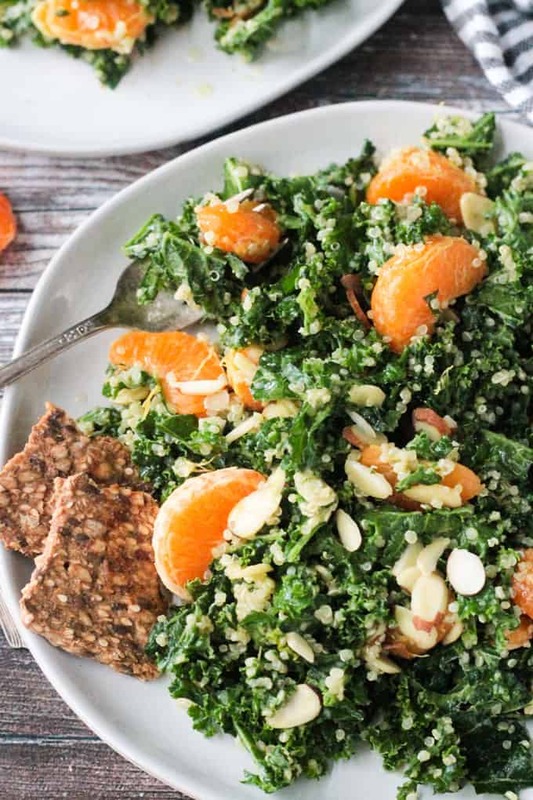 You need to be eating leafy greens and this Kale and Quinoa Salad is a great place to start! I have a bit of an obsession with adding fruit to savory salads. The fruit brings a lovely sweetness that balances the flavors perfectly and in a healthy way. They also bring another level of texture, which is so important in a salad. I use oranges in my Broccoli and Brussel Sprout Salad and my Lentil Quinoa Salad. I use apples in my Lacinato Kale Superfood Salad, Curried Tofu Salad, and my Quinoa Spinach Salad with Butternut Squash. I use grapes in my Vegan Chickpea Salad, Raw Veggie Chopped Salad, Vegan Quinoa Salad with Fresh Dill and Lime, and my Roasted Cauliflower Salad with Lentils. I even use strawberries in my Creamy Balsamic Summer Pasta Salad. I know there are quite a few people that frown upon using sweet fruits in savory dishes, but you’ll never get me to agree with them! Do you like fruit in your savory salads? This Kale Quinoa Salad is filling enough to stand on it’s own. I love it for a light lunch or an easy summer dinner. But, it’s also perfect as a starter or alongside a larger meal. It won’t wilt, so pack it up in a lunchbox or any air-tight container for eating on-the-go. 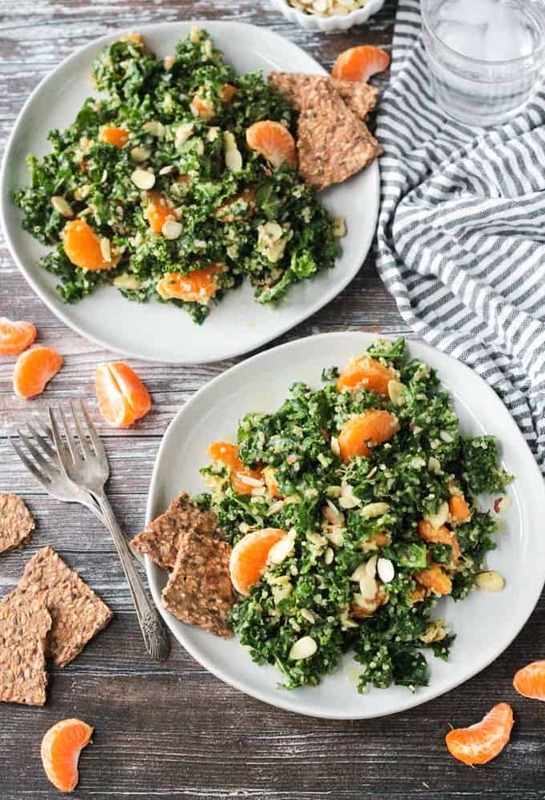 I hope you love this Kale and Quinoa Salad as much as we do. If you try it, please come back and leave me a comment below with your feedback and star rating. You can also find me on social media. Be sure to tag @veggie_inspired and #veggieinspired to your remakes so I’m sure to see it. Add the quinoa and water to a pot on the stove and bring to a boil. Cover, reduce heat to low, and simmer 12 to 15 minutes until the quinoa is cooked through and the water is absorbed. Take off heat and let cool. Meanwhile, add the kale, avocado, lemon juice, salt, and pepper to a mixing bowl. With clean hands," massage" the the kale making sure the avocado is completely mashed into the kale. Massage for a several minutes to allow the ingredients to soften. Set aside. 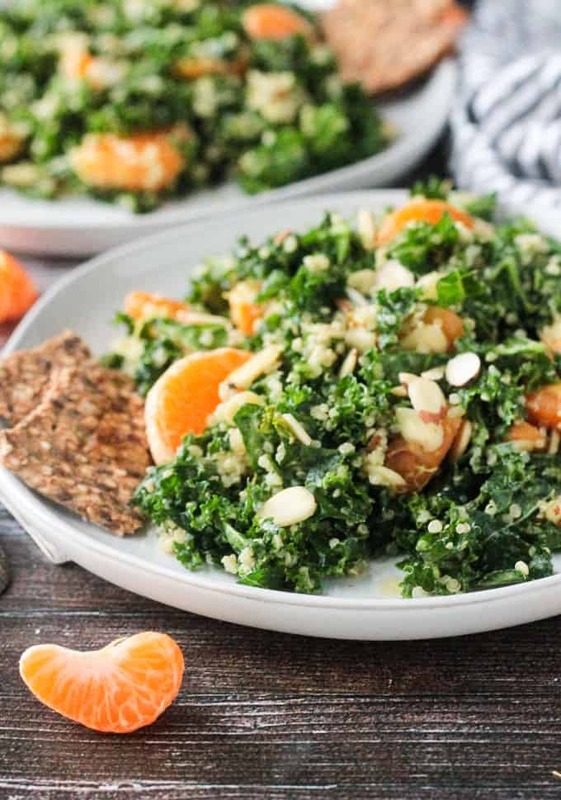 Once the quinoa is mostly cool, add it to the kale along with the orange segments and almonds. Drizzle with extra virgin olive oil, if desired. 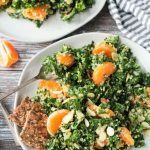 ~Kale holds up very well and this salad will keep for several days in an air-tight container in the fridge. This salad rocks! I used canned mandarins (sort of high in sugar, but I drained them well) My husband and I ate the entire bowl! I love your recipes Jenn! That’s wonderful to hear, Chris! Thank you so much! This was great. I had cooked rice already on hand and used that and it worked fine. So happy to hear that, Colleen! Thanks for your comment!